Android Developers Blog: Google Play game services ends year with a bang! Google Play game services ends year with a bang! In an effort to supercharge our Google Play games services (GPGS) developer tools, we’re introducing the Game services Publishing API, a revamped Unity Plugin, additional enhancements to the C++ SDK, and improved Leaderboard Tamper Protection. At Google I/O this past June, the pubsite team launched the Google Play Developer Publishing APIs to automate the configuration and publishing of applications to the Play store. 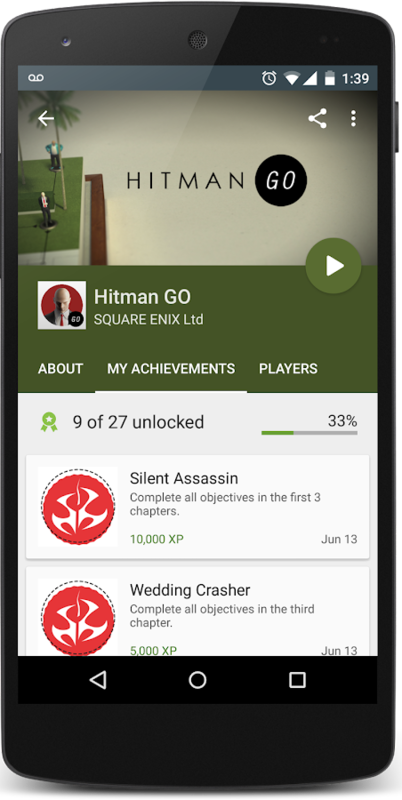 Game developers can now also use the Google Play game services Publishing API to automate the configuration and publishing of game services resources, starting with achievements and leaderboards. For example, if you plan on publishing your game in multiple languages, the game services Publishing API will enable you to pull translation data from spreadsheets, CSVs, or a Content Management System (CMS) and automatically apply those translations to your achievements. Keisuke Hata, Manager / Technical Director, SQUARE ENIX Co., Ltd.
To get started today, take a look at the developer documentation here. We also include some important bug fixes and stability improvements. Check out the release notes for the Unity Plugin and the getting started page for the C++ SDK for more details. Turn on Leaderboard Tamper Protection to automatically hide suspected tampered scores from your leaderboards. To enable tamper protection on an existing leaderboard, go to your leaderboard in the Play developer console and flip the “Leaderboard tamper protection” toggle to on. Tamper protection will be on by default for new leaderboards.Learn more. To learn more about cleaning up previously submitted suspicious scores refer to the Google Play game services Management APIs documentation or get the web demo console for the Management API directly from github here. In addition, if you prefer command-line tools, you can use the python-based option here.